I love Mexican food and these bean burritos are one of my favorites. You don’t have to be a vegetarian to want a meatless meal once in a while. Many of us can do with eating a little less meat. This vegetarian burritos recipe mixes refried beans with a variety of delicious vegetables for a recipe that combines great taste with great nutrition. In a large skillet, heat the oil over medium high heat. Add the onions and garlic. Cook, stirring, for 2 minutes. Add the zucchini, peppers, mushrooms, jalpeno peppers, oregano and thyme. Cook, stirring often, for 3 minutes. Add the chili powder and cook, stirring, for 1 more minute. Stir in the beans and reduce the heat to medium. Cook 5-10 minutes, stirring occasionally. Stir in the coriander, 1 cup of cheese, salt and pepper. Mix well. Evenly divide the mixture among the tortillas, placing the mixture on the lower third of the tortilla. Roll up the tortilla at the bottom, then tuck in the sides, then finish rolling to the end of the tortilla. Secure it with toothpicks if you need to. Place the tortillas on a baking sheet. Bake at 425ºF for 10 minutes. Sprinkle the remaining cheese on top and bake for another 2 minutes. 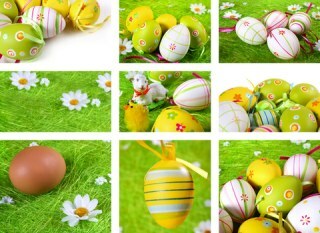 Remove the toothpicks and serve with the garnishes mentioned below or any others you may prefer. Garnish your burritos with any or all of the following: shredded lettuce, salsa, guacamole, sliced black olives, chopped tomatoes and sour cream. You can substitute black beans for the refried beans if you prefer or if that is what you have on hand. I often use a mix of black beans and refried beans. It gives the burritos a great texture. Add the peppers near the end of the cooking time if you want to maintain a nice crunch. You can also use mozzarella cheese in this recipe, but I don’t find it adds as much taste in this recipe as the cheeses mentioned. A strong cheese is nice. 1. Cut down on the amount of cheese. If you use half the cheese, the burritos will still taste great and you will will have cut out a lot of fat. 2. Add more vegetables. This healthy recipe is full of vegetables already, but adding in a few more, or more of what is already in the recipe adds more nutrients to the final dish. 3. Use whole wheat tortillas. Using whole wheat tortillas adds more fiber to the recipe. Or, even though it isn’t traditional, you can use corn tortillas. Whole grain corn is a healthy alternative to wheat tortillas. 4. You can also add color, nutritional value and taste by topping each burrito with chopped tomatoes, sliced black olives and chopped peppers. This recipe will really fill you up, as the beans are quite filling. You can probably count on 2 burritos per serving, although those with a very light appetite may only want one. Serve these lovely tortilla rolls garnished with sour cream, salsa and guacamole. 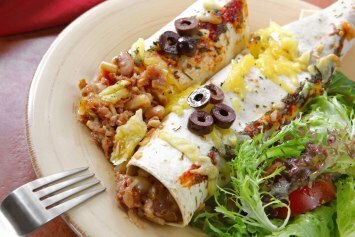 Serve our tasty bean burritos with a large salad and/or rice that has been cooked with tomatoes and chopped coriander. In addition to these bean burritos, we also have a cheese and beef burritos recipe here.